Nowadays it seems like everything is being stored in the digital cloud. From Apple’s iCloud for your music and photos to Google Drive for documents and spreadsheets, cloud storage is changing the way business is done. For many business owners, the data that exists on your company’s servers is growing faster than you can store it. Internal servers are sluggish and get overloaded quickly by a large amount of data that is stored and accessed on a regular business day. Cloud storage is an effective way to help solve the issues many businesses have with internal servers. From misplacing important documents to trying to share files, to large documents eating up minutes of your valuable time loading, servers can make you less productive at work. Thankfully, the professionals at Computer Troubleshooters have identified five ways that cloud storage can help your business get back on track with efficient digital storage. 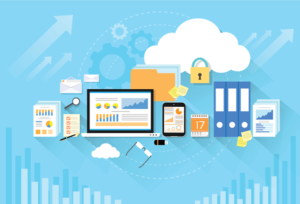 How Can Cloud Storage Help My Business? A significant portion of a business’ day to day work is done on computers. From editing documents and spreadsheets to creating reports, files are created and modified regularly. Each time another file is saved on your server, storage space decreases. Buying and maintaining new servers to grow the size of your digital storage costs money. With cloud storage, you eliminate the need for costly internal servers. Running out of digital space no longer results in a panicked order for another server, it is a quick call to your cloud manager to ask for a storage increase. Becoming eco-friendly is one of the top items on many organizations’ to-do lists. Internal servers draw a lot of power as they operate. If you are looking for ways to be more environmentally conscious as a company, making the switch from servers to cloud storage can drastically cut down on the utility bill by saving energy. From server failures and employee mistakes to natural disasters, data loss is a major concern for companies. With the increased reliance on digital files, cloud storage can help protect your business against significant data loss. When your records and data are stored in the cloud, you don’t have to worry about a power failure or flood wiping out the digital lifeline of your company. Having access to files is one of the most important aspects of having a productive day. With internal servers, employees usually can’t access files stored on the server unless they are physically plugged into it. Cloud storage allows data to be accessed wherever you are, whether you need to open the budget spreadsheet from your hotel room or your Photoshop file from the comfort of your home office. One of the main concerns with cloud storage is security. Many incorrectly assume that cloud storage is not as secure as a physical server. Cloud storage technology has multiple security measures in place to protect your data. From file encryption to password protection, your data is safe when stored in the cloud. If you are curious about how cloud storage can work for you, contact us today!